My first breakfast in San Juan I needed coffee and protein. Damn body clock and jetlag are getting to me, so I headed out early into the very quiet streets of Old San Juan and hunted out some sustenance. Coffee!!! 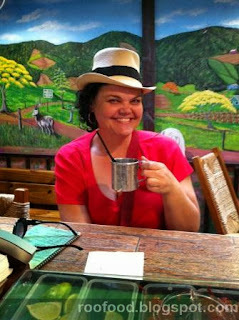 Grown locally (and also imported to appease the masses) – locals really know their coffee beans and all around town places are advertising which beans they use and how they are roasted. Big competition! 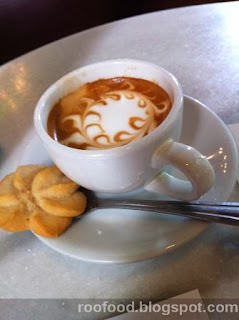 On a recommendation, I headed to Café Cultura to test my coffee tolerance. This café is buzzing. Locals brunching, tourists hovering about deciding whether or not to delve into the crowded café. I opted for a very strong macchiato – instant wake up. With a serving of egg scrambled with spinach and feta, it was the breakfast that I needed to kick the jetlag out of the way. 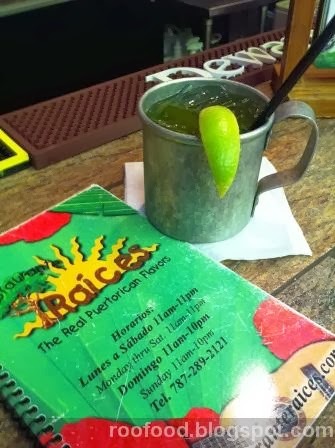 Over the course of the few days that I had in San Juan I ended up eating at Raices twice. Once before the cruise and a second time after the cruise. 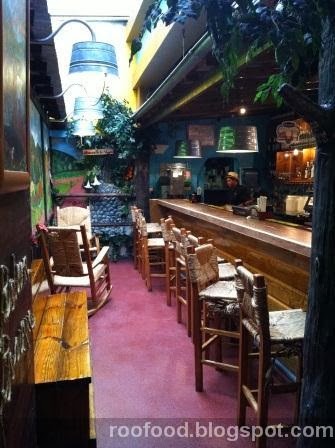 Raices is a San Juan local restaurant and heavily aimed at the tourist. However, locals do eat there from time to time. 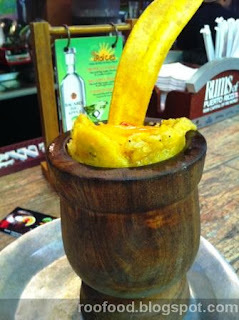 What they are most famous for is their mofongo, the local staple of mashed green plantain with a stew or meat topping. They are also known for the Mojitos. As it was very crowded over lunch time - lots of cruise day trippers - I managed to get a seat at the bar (which was empty? ), which turned out to be great as I got to chat to the lovely bartenders, who maybe just flirted a little bit with me. That's okay, I gave it back to them (especially after a couple of mojitos!). Servers are dressed in traditional clothing and the decor is very over the top! Murals are painted on the wall to look like the countryside. Passionfruit mojitos straight up in a metal cup - keeps it icy cold. Tasty and very strong mojitos! and only Barcadi is used here. Flirting so much I even got to wear my waiters hat! The first visit I just wanted some snacking food to go with my mojito. I opted for the Festival Boricua, which is a platter of Cassava and cheese fritters, corn sticks, cassava sticks and plantain chips. With a mayo dipping sauce. I'm sure this appeals to many and is best shared between 2 or more people. It was all deep fried and stodgy. 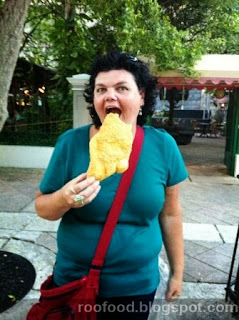 What I did like was that I got to try a variety of snack foods. Maybe it was because I wasn't overly hungry either. The second visit was better. I was sitting in the main restaurant and ordered the Mofongo with Mojo Isleno style prawns. This was the bomb. Garlic and buttery mashed plantains with a sweet tomatoey sauce and big fat prawns. 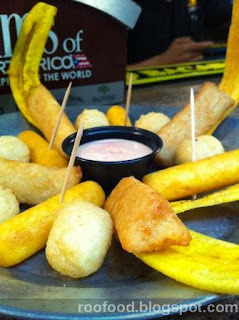 The crispy plantain on top was great for scooping out the bits from the bottom. There is something special about eating out of a wooden pestle style bowl! Some exploring around the Princess promenade and I found a cart selling slabs of crispy shards of chicharron, aka pork crackling. You can by by the poundage...this piece that I'm holding is 1/3 of a pound....okay as much as I wanted to, I didn't eat the whole thing in one go...but I did take a big shattering bite! My last night in San Juan I was delighted to have a friend dine with me. Chris from the cruise was flying standby and couldn't get a flight, so she came and stayed with me for the night. 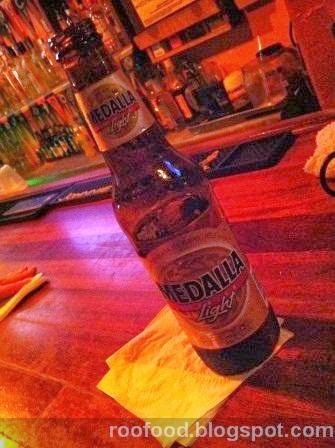 We headed out and about and ended up in a bar for a few Medalla's before dinner. We ended up at the famous Parrot Club. 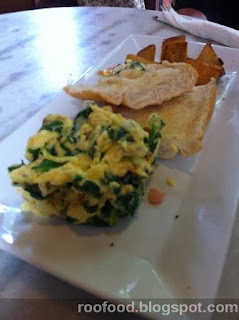 A dimly lit restaurant that is perfect for either big groups or romantic interludes in the corner seating. apart from the romanticness of it, we were not that impressed with the wait staff or the food generally. Not sure what the hype is about this place. Maybe we were there on an off night. It too far to long for our drinks and our orders to be taken. then we over ordered and ended up with so much food...oh well you live and learn. We order the Mofongo de Yuca y plantaino - which is a mofongo made with a mix of mashed plantain and yucca. 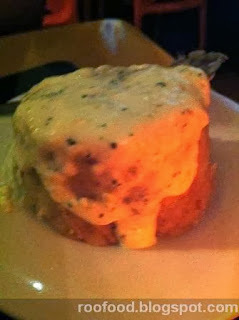 Not as light and fluffy as the original...but to try it with yucca was a nice change. Other dishes were the Cuban Black bean croquettes, Amarillos en Almibar Queso del Paio (sweet plantains in syrup with fresh local cheese) and the Viana Nachos con Ropa Vieja, which was a latino stewed beef, monterey jack cheese, aguacate, sour cream and cheese. (somehow I've missed placed the photos).